I’m a self taught primitive Folk Artist livin’ in the Everglades Region of SW Florida. What y’all see is a unique one of a kind painting. The piece your’e lookin’ at is entitled “Highway Lightnin'”, & measures 20″ X 20″. 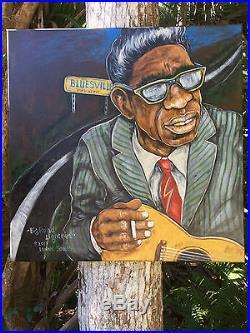 Texas country Bluesman Sam “Lightnin'” Hopkins has always been a huge inspiration for me, the epitome of a Master Bluesman… And, my most favorite. So y’all know, I paint over the canvas edges, an’ many folks love that look without later purchasing an exterior frame. And, honestly, like all my work… Folks near always say this original painting is really far better in person. Its’ just real tough to get an adequate photo here in the Florida sun & humidity, and color tone, detail & nuance often suffers. Please NOTE: ” Highway Lightnin'” is a fully copyrighted & protected image, and may not be reproduced without specific written permission of me, Artist Lennie Jones. 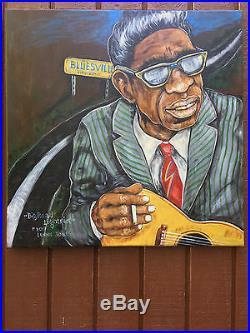 The item “Lightnin’ Hopkins Texas Guitar Blues Original Folk Art Painting by Lennie Jones” is in sale since Monday, July 17, 2017. This item is in the category “Art\Paintings”. 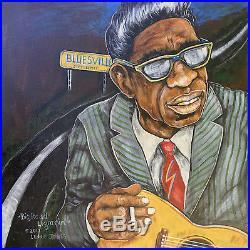 The seller is “lenniefolkartblues” and is located in Naples, Florida. This item can be shipped to United States, Canada, United Kingdom, Denmark, Romania, Slovakia, Bulgaria, Czech republic, Finland, Hungary, Latvia, Lithuania, Malta, Estonia, Australia, Greece, Portugal, Cyprus, Slovenia, Japan, China, Sweden, South Korea, Indonesia, Taiwan, South africa, Thailand, Belgium, France, Hong Kong, Ireland, Netherlands, Poland, Spain, Italy, Germany, Austria, Russian federation, Israel, Mexico, New Zealand, Philippines, Singapore, Switzerland, Norway, Saudi arabia, United arab emirates, Qatar, Kuwait, Bahrain, Croatia, Malaysia, Brazil, Chile, Colombia, Costa rica, Panama, Trinidad and tobago, Guatemala, Honduras, Jamaica, Antigua and barbuda, Aruba, Belize, Dominica, Grenada, Saint kitts and nevis, Saint lucia, Montserrat, Turks and caicos islands, Barbados, Bangladesh, Bermuda, Brunei darussalam, Bolivia, Ecuador, Egypt, French guiana, Guernsey, Gibraltar, Guadeloupe, Iceland, Jersey, Jordan, Cambodia, Cayman islands, Liechtenstein, Sri lanka, Luxembourg, Monaco, Macao, Martinique, Maldives, Nicaragua, Oman, Peru, Pakistan, Paraguay, Reunion.